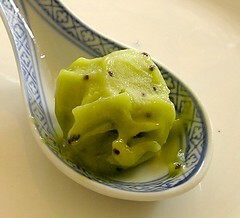 Kiwi avocado ice - Do You Know The Muffin Man? Recipe from LCBO Food & Drink, Summer 2001. Notes: I puréed both the kiwi and avocado in the food processor, why mash it by hand? Great colour. Tastes mostly of kiwi, but avocado provides smooth texture.